The field of alternate history has been somewhat stark of late. Not a lot has been released after the heyday of the nineties and the noughties, although Harry Turtledove (bless him!) is still muddling along. Perhaps because the big ideas, even the good ones, have been written to death. The South has won umpteen American Civil Wars, and the Nazis have triumphed in World War II so often you could be forgiven for thinking that ours is the lone alternate timeline in which they haven’t. For a new author to enter the fray, then, is a big deal, and they don’t come a much bigger deal then Gregory Benford, whose previous output of science fiction novels should be well known to most readers. With novels of hard science fiction such as In the Ocean of Night and Timescape under his belt, you may be forgiven for asking why Mr Benford has decided to detour to alternate history. In The Berlin Project, the two genres are very closely linked. He presents us with a true book of science fiction, which is to say a book of fiction revolving around and dependent upon science. The Berlin Project is the story of Karl Cohen, freshly returned from Europe and beginning research work at Columbia University. Here he is introduced to a group of physicists who would later form the nucleus of the Manhattan Project. In our timestream, Cohen both existed and worked on the Manhattan Project, but not to the extent seen in this book. Here, Cohen—with the help of his mother—secures additional funding for the building of a trial centrifuge for the separation of uranium isotopes. In real life, the centrifuge exploded on its first trial, and Columbia could not rebuild it. In The Berlin Project, Cohen’s extra funding enables a backup to be built, and the project is a success. This leads the Manhattan Project to assemble enough uranium for a nuclear bomb roughly one year earlier, just in time for the D-day landings. There is plenty in this book to suit just about everyone’s taste. Having the bomb a year early presents operational difficulties, as the B-29 is not yet available, so military buffs will love the mental image of “Little Boy” being carried by an RAF Lancaster. The science is top-notch and correct. For example, the issues that made the centrifuge explode were discovered after the war and solved. And science fiction fans will enjoy the involvement of several real-life authors on active service in the RAF in 1944/45. The Berlin Project, however, is not simply a shoot-‘em-up action story (although there are elements of great action), nor is it a dry scientific tome. Cohen is Jewish (racially, if not religiously) and is haunted by reports from Europe, as well as from his treatment in the US. This feeling of injustice drives Cohen through the narrative in a complex way. He is non-religious, yet his success in the Manhattan Project comes from empathising for his fellow man in Europe, while also from his mother’s religious connections with Rabbi Kornbluth and a cabal of investors. There are times in the book where Cohen seems a man apart, neither Jewish nor non-Jewish. Benford is certainly batting on the side of the angels when showing Cohen’s appreciation of the Jewish situation in the US in the 1940s, but this feels overbearing when it becomes apparent Cohen is not so mindful regarding the experiences of others. When Cohen helps General Groves set up the Oak Ridge facility, for example, no mention is made that, despite being a federal government facility, it is also segregated. Cohen notes the African-American workers at Oak Ridge, but he expresses no reservations regarding their living conditions or the overt discrimination they suffer. Similarly, when someone tells Cohen that Hitler is sending Gypsies to the camps as well, there is no reaction, nothing like he has been feeling for his compatriots throughout the novel. The book is almost two separate books published together. While the first half of it is mostly scientific, set in New York and Tennessee, the second half is a faster-paced action story that takes place in Europe, as Cohen is sent there to oversee the first bomb’s deployment. Cohen becomes the man of the moment, travelling over much of Europe to discover the extent of the Nazi’s nuclear program. A lengthy epilogue, set in the early sixties, allows Benford to showcase his idea of how Cohen’s actions would have changed the world, although this seems like wishful thinking at times. In the afterword, we also learn Benford’s reason for writing the novel, which is both charming and wonderful. 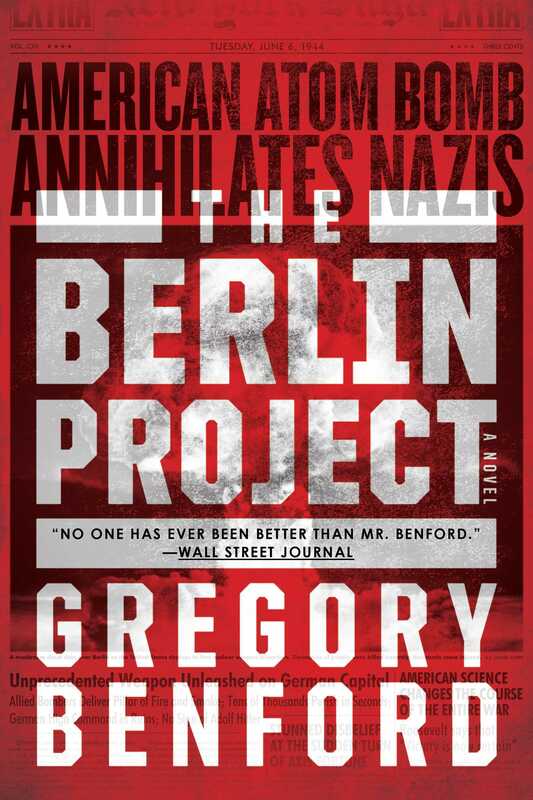 The Berlin Project not only succeeds as an alternate history story, but also as a science textbook and an action-adventure novel. Unlike a lot of alternate histories which exist solely for the “ain’t-it-cool” factor, it has great emotional depth.